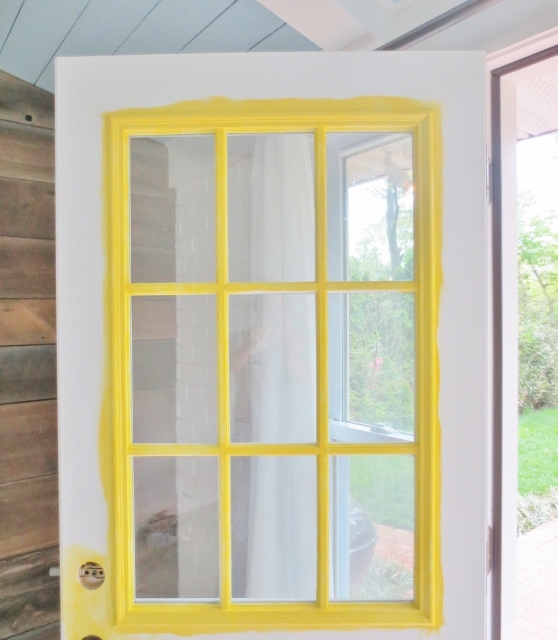 A few weeks ago I finally got around to painting the exterior side of our sun room door. 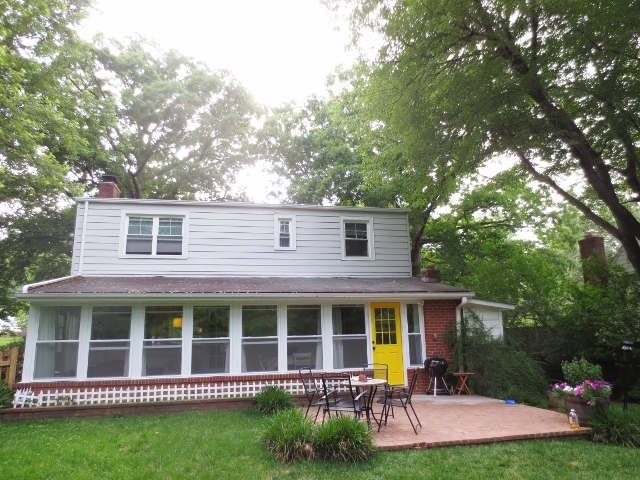 We are going to keep the interior side white, but thought it might be fun to put a color on the exterior side. We wanted something bright and cheery that would compliment the brick. 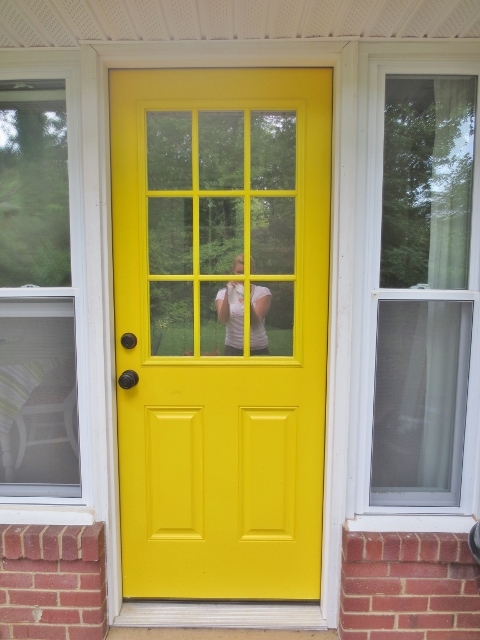 I was willing to be a little daring with this paint color since this door is on the back of the house. I thought about a limey green, red of course, as well a charcoal, black and navy like our front door. In the end we settled on a nice bright yellow. Nothing too mustard or too highlighter, but definitively bright and yellow. Unlike the hallway, I didn’t over think this paint choice too much. 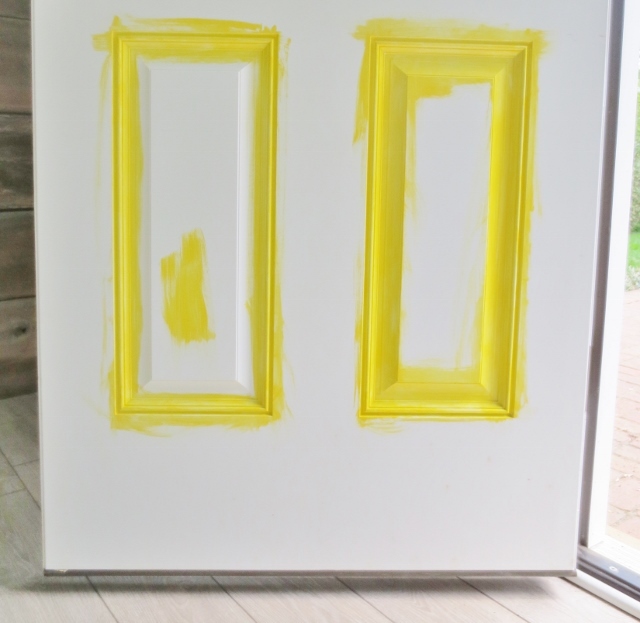 After living with a few chips taped to the door for about a week, we settled on Behr’s “Sunflower.” I bought I quart in Behr Exterior Premium Plus paint in a semi-gloss finish. I removed the hardware and started using a narrow brush on the trim between the glass. I didn’t tape the windows off because it’s pretty easy to removed dried paint from glass with a razor blade. I actually was able to just use the “manicure” technique of using my thumb and a paper towel to wipe up runs as I went. It probably took me a hour, maybe a little more, to go around each of the windows. When I was done, I used a brush to get into the crevices of the panels before breaking out my foam rolling for the wide, flat parts. That took about 15 minutes. The good news was that the window trim didn’t need a full second coat so it took about half the time to just go over it all a second time. I did a full second coat on the rest of the door, waiting for it to try before re-installing the hardware and viola! The color is bright, but I like it and think it’s a fun surprise on the back of the house. What did everyone do this weekend? Any good DIY projects I should know about? 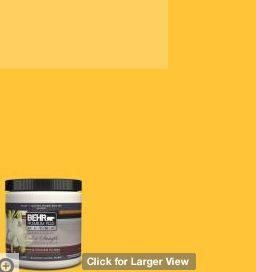 Yellow and white is very compatible to each other. It was very nice color for the outer door. Is it a fresh appearance. I liked it very much. I love that pretty pop of color! What a fun way to add drama in the back yard!